Micilin with Gay Byrne at the ceremony. Brain damaged after a serious road collision Galway man Micilin Feeney has worked tirelessly to promote road safety awareness across the country and now those efforts have been officially recognised by the Road Safety Authority (RSA ). 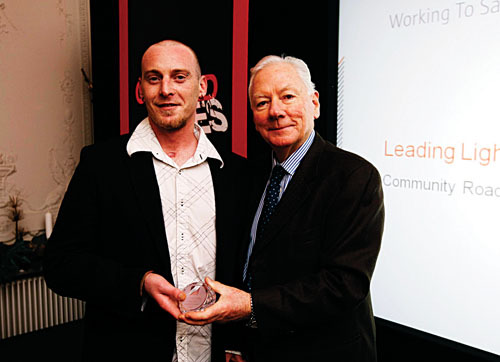 Micilin, a road collision survivor whose story is featured in the RSA’s ‘Crashed Lives’ TV campaign, received an award recently at the first ever Leading Lights Road Safety Awards. In the RSA advert launched a year ago, Micilin, from Lettermullen, talks about how he had it all: a promising trade as a brickie, good money, a fiancee, and being named player of the year for his local team Naomh Anna until the car crash on Halloween night in 2004 which changed his life forever. Micilin, who had been drink driving that night, tells his audience “if you think drinking and driving is cool, just think of me”. He now travels across the country talking to teenagers and young adults about his experience in an effort to raise awareness of road safety. The awards, organised by the RSA, were presented at Farmleigh to honour the outstanding efforts of people from community groups, companies, industry groups, and schools nationwide to improve safety on Irish roads. The RSA presented a total of nine Leading Lights Road Safety Awards. Recipients included Charlie Collins of Highland Radio, a consistent supporter of road safety improvement initiatives in County Donegal who was awarded the Supreme Award; the late Mr Vivian Foley, an award winning author who lectured at Cork Institute of Technology was awarded a Posthumous Award for his work in promoting road safety right up to the time of his death in 2003; the Kildare Road Users Association (KRUA ), a group of volunteers including driving instructors, bus drivers and school principals who devise road safety initiatives and work with the road safety officer to implement them; and Ann Moran, whose daughter was killed in a collision, for bravely sharing her personal experiences at local and national road safety events.